Clear 8 mil archival polypropylene page holds six 4" x 6" prints or postcards. Fits in most 3-ring binders. Print File 8 mil archival photo holder sleeves provide an ideal acid free storage solution. Holds six 4x6 prints. 25 pack. Print File 8 mil archival photo holder sleeves provide an ideal acid free storage solution. Holds six 4x6 prints. 100 pack. High clarity 8 mil archival polypropylene page holds six 4x6 prints. Fits in most 3-ring binders. 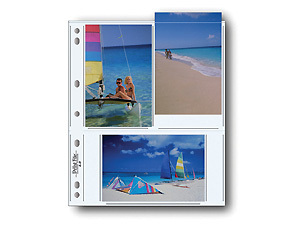 These Print File Clear Archival Photo Holders provide an ideal acid free storage solution for 4x6 photos or postcards. Note: Due to manufacturing changes this item will no longer include a shaded white writing area and will be 7-hole punched so it can also work in 4-ring binders. This is a rolling change and we can not guarantee which version is currently shipping.